Indications: Selective serotonin reuptake inhibitor (SSRI) commonly prescribed to treat depression, bipolar disorder and other mental health conditions. Summary Recommendations: You should always take citalopram as prescribed. Never stop taking this or any other SSRI without first contacting your physician as withdrawal symptoms may occur. Citalopram is most commonly prescribed as Celexa. General Precautions: Celexa is used to treat depression and other mental health conditions. The drug is associated with spontaneous abortion and infant side effects/withdrawal. If you are thinking about trying to conceive, talk with the prescribing physician about changing to a safer medication before conception. If you've recently found out you're pregnant, contact your doctor immediately to weigh your options. Celexa should not be taken with Orap, Zyvox, Furoxone, Marplan, Nardil, Azilect, Emsam, Zelapar, Eldepryl or Parnate. If you are currently taking any other SSRIs or prescription/over-the-counter medications for depression, tell your doctor immediately. Patient and patient family medical history is extremely important. If there are any cases of Long QT syndrome or heart rhythm disorder, tell your physician before taking the first dose of Celexa. Effects While Trying to Conceive: The effects of Celexa on fertility has been tested in animal studies, but not in human studies. In animal studies doses in excess of 5 times the maximum recommended human dose (MRHD) caused fertility problems and doses in excess of 8 times the MRHD caused prolonged gestation. Effects on Pregnancy: Celexa should be taken only during pregnancy if there are no other drugs available with the same treatment effect. Celexa passes through the placenta. 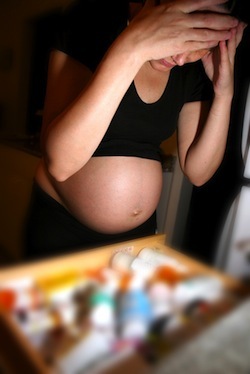 Use during the final trimester of pregnancy may lead to fetal complications. There has been at least one report of an infant suffering withdrawal from Celexa after birth. The mother was taking Celexa throughout pregnancy. Similar reports are found in other cases where pregnant women used selective serotonin reuptake inhibitors during pregnancy. Complications for the infant may include sleep disorders, apneas and withdrawal if the drug is taken for the duration of the pregnancy or during the final trimester. Cases of spontaneous abortion have also been reported by the manufacturer of the drug. Safe During Breastfeeding: Citalopram or Celexa is excreted in breast milk. The amount excreted, based on study tests, can range from 0.9% to 9% of maternal dose. There have been adverse side effects reported, including reduced feeding and weight loss, in infants breastfeeding from mothers taking Celexa. Celexa should not be used during breastfeeding unless the benefits of the drug outweigh the potential risks to the infant.